Raise the vehicle on a suitable support. Refer to Lifting and Jacking the Vehicle. Remove the tire/wheel assembly from the vehicle. Refer to Tire and Wheel Removal and Installation. Dismount the tire from the rim. Refer to Tire Dismounting and Mounting. When servicing the tire pressure sensor always use a new Schrader® tire pressure monitoring (TPM) sensor and a new TORX screw during installation. 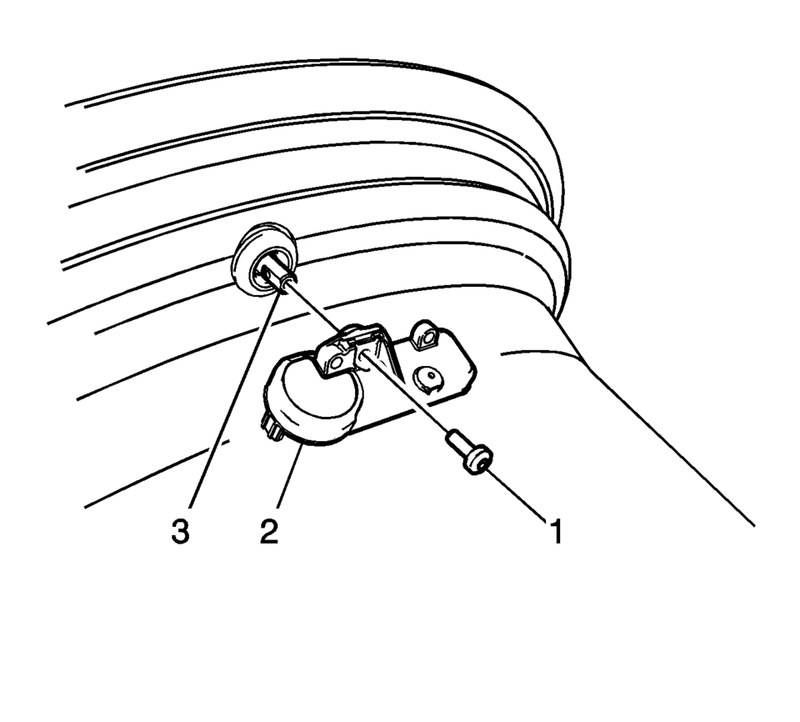 Remove the TORX screw (1) from the tire pressure sensor (2) and pull it straight off the tire pressure valve stem (3). 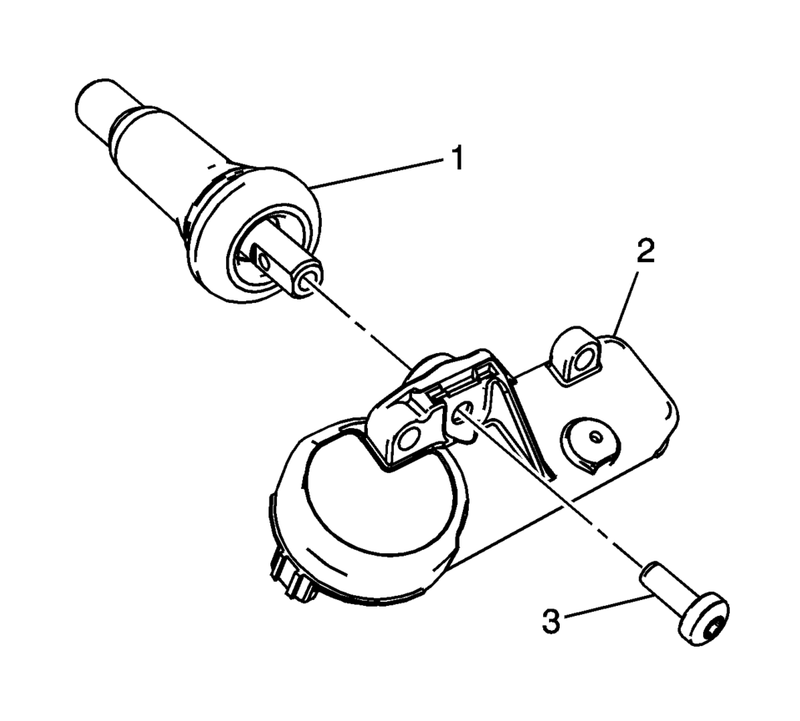 Remove the tire pressure valve stem by pulling it through the rim. 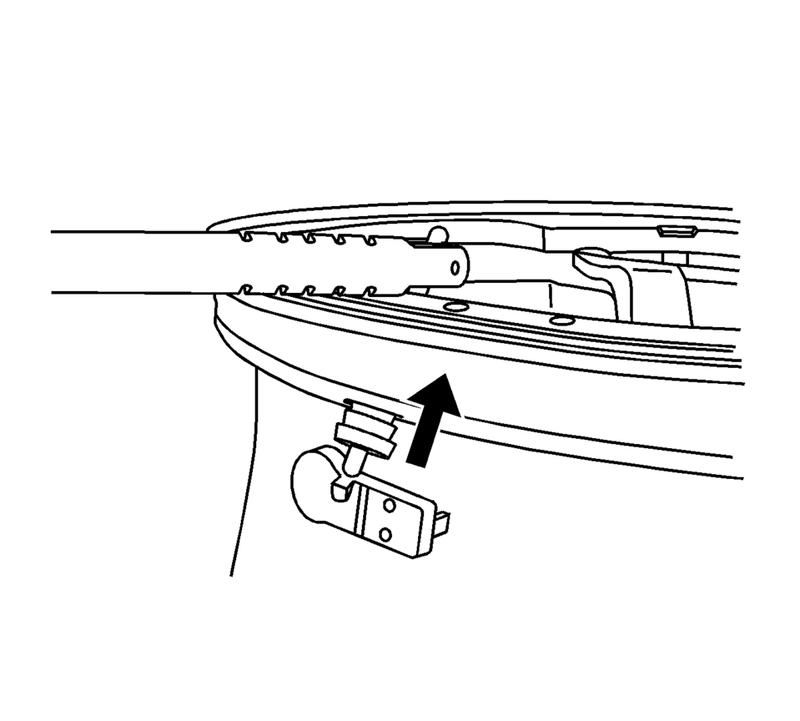 Ensure the flat of the valve, lines up with the flats of the snap in the enclosure. TPM valves and TORX screws are single use items. Use an approved tire mounting lubricant. DO NOT use silicon or corrosive base compounds to lubricate the tire bead and the wheel rim. A corrosive type compound can cause tire or rim deterioration. Apply tire soap to the rubber portion of the valve stem (1). Using a tire valve stem mounting tool, pull the valve stem through in a direction parallel to the valve hole on the rim. Snap Fit TPM sensors are shipped in the OFF mode. The sensor will exit its OFF state when the tire is inflated. Mount the tire to the rim. Refer to Tire Dismounting and Mounting. Install the tire/wheel assembly on the vehicle. Refer to Tire and Wheel Removal and Installation. Learn the tire pressure sensors. Refer to Tire Pressure Indicator Sensor Learn.